Ideas for articles and tutorials come to mind so fast I usual rush to jot them down on paper or a .txt file. In 2013, I will keep my future article ideas and titles published on my site so I can see and update the list from any device. 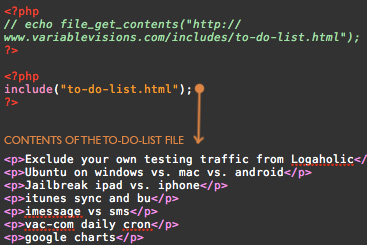 I could use php file get contents, read file, or include. Although I am not processing more php scripts, I still elected to use include since it doesn't not require a full path as does file get contents and read file. You can use php read file instead of file get contents, but from my testing, the speed advantages are negligible. The php include is great for including the content of other files, whether on the same server or not, and including more scripts or just html/text.